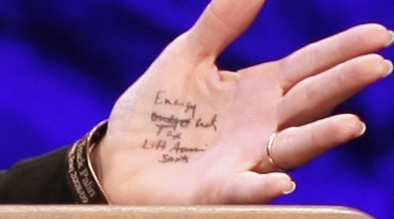 Closer inspection of a photo of Sarah Palin, during a speech in which she mocked President Obama for his use of a teleprompter, reveals several notes written on her left hand. The words "Energy", "Tax" and "Lift American Spirits" are clearly visible. There's also what appears to read as "Budget cuts" with the word Budget crossed out. Just to be clear: The notes most likely weren't for her speech, for which she used prepared remarks, but for the Q&A session that followed, during which she glanced at the hand in question. But in my opinion that's even worse. There were no specifics on there, just general concepts and things she supports. The takeaway is that this presidential contender apparently can't remember her supposed core principles and needs a cheat-sheet when simply asked about her beliefs. Keith Olbermann gets to the heart of the issue. 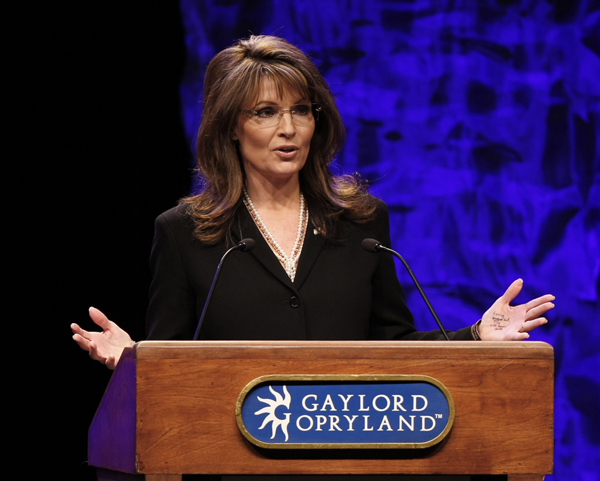 It's not just about hypocrisy - it's about Palin's apparent lack of ideas and core principles. Ahh sweet Earl Grey Revolution! Sarah Palin knew that speech like the back of her hand. The Q&A answers, however, were on the front of her hand. 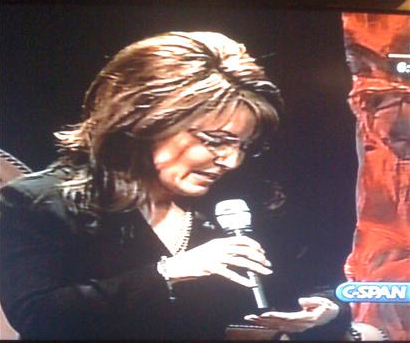 During the Q&A following her speech at the Tea Party Convention, Ms. Palin appeared to read from her hand in answering. 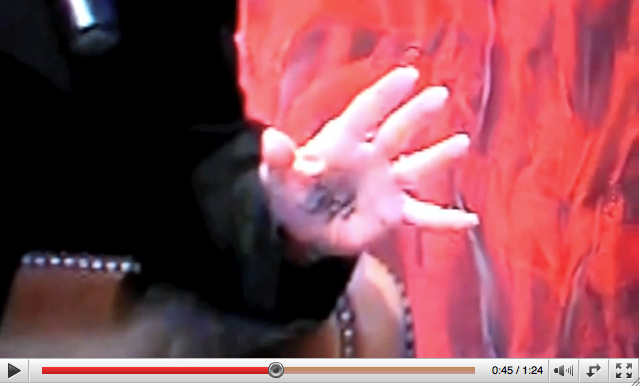 UPDATE #2: A high-quality video on youtube seems to prove that something was indeed on the palm of Palin's hand. The question is what. Crib Notes? This potential presidential candidate and "movement" leader was using crib notes to answer basic questions? B) That she still couldn't answer the previously agreed-upon questions without a little extra help. If true, this is supremely rich coming immediately after a speech in which Palin took a shot at President Obama for using a teleprompter to read his prepared speeches. You can bet that the President wasn't reading scribbles off his extremities while he sparred with Republicans and Democrats in an unscripted format in his recent Q&As. Palin, on the other hand, seems to need a cheat-sheet just to get through a contrived lovefest with a smitten interviewer and an adoring audience. I'm no fan of the Tea Party movement - if it can be called such - but if this is their leader I actually sympathize with them.